Furnishings like the Pooch Perch Benches add comfort and versatility to complete any community dog park or doggie day-care facility. 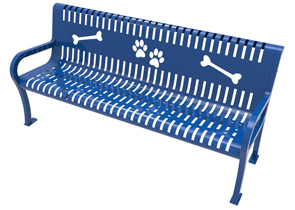 Whimsical design that is engineered for durability, the 6' all-steel benches are precision crafted showcasing laser cut paw prints and bone detailing. A thermoplastic coated finish safely protects the steel benches against urine, rust, fading and other environmental elements/conditions. Whether taking it easy watching 'man's best friend' run freely about or when the whole canine crew is ready for a break, Pooch Perch Benches are a favorite amongst all visitors.